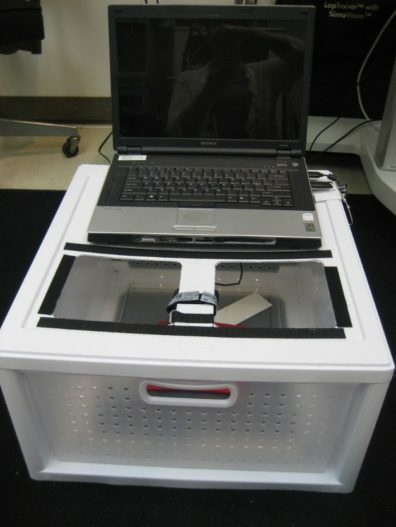 It is possible to simply construct a low-cost home-made version of a training box, using a web camera, a LED light strip and a plastic storage box as illustrated in the pictures below (figures 2-4). It is important that the web camera is of high quality and compatible with the intended laptop to provide real-time images, and that the head swivels so “up” is projected “up” if mounted similar to that shown in the images below. Figure 2 and 3. Homemade training box constructed by cutting holes in a plastic storage box, attaching a “skin” of neoprene, a web camera and a LED light strip. The head of the web camera need to be swiveling so the orientation up continues to be up, despite it’s upside down location in the box. The camera also need to have a minimum of 30 fps to be perceived as real time. Figure 4. 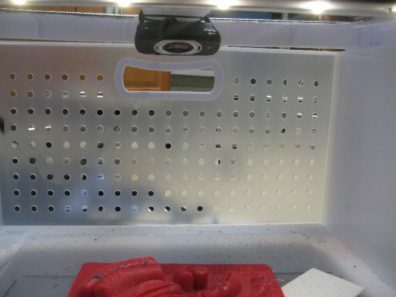 The holes cut in the top of the drawer box, with loop and hook fastener for the neoprene “skin”. The center is used for attaching the camera. Walczak DA, Piotrowski P, Jędrzejczyk A, Pawełczak D, Pasieka Z. 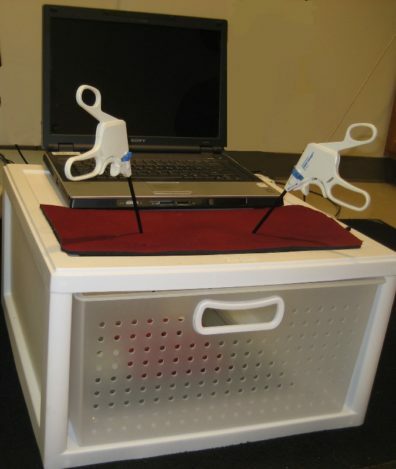 A laparoscopic simulator – maybe it is worth making it yourself. Wideochir Inne Tech Maloinwazyjne. 2014 Sep;9(3):380-6.
van Duren B, van Boxel G. Use your phone to build a simple laparoscopic trainer. J Minim Access Surg. 2014 Oct;10(4):219-20. Khine M, Leung E, Morran C, Muthukumarasamy G. Homemade laparoscopic simulators for surgical trainees. Clin Teach. 2011 Jun;8(2):118-21.